The direct support workforce is crucial in providing daily supports to people with intellectual, developmental, and other disabilities in the U.S. as they live and participate in their communities. While demand for these supports has never been higher and will continue to grow, significant challenges exist in finding, keeping, and training Direct Support Professionals. 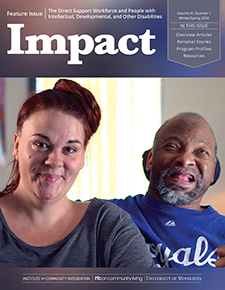 The new Impact: Feature Issue on the Direct Support Workforce and People with Intellectual, Developmental, and Other Disabilities (pictured) examines the workforce challenges in our long-term care system and their consequences. It presents data on the direct support workforce; shares personal stories of what is and isn’t working for those delivering and receiving supports; looks at creative, bold actions being taken around the country to address workforce issues; and explores ways to ensure that quality supports are there for people with disabilities and their families in all our communities. Impact is published by the Institute on Community Integration, and the Research and Training Center on Community Living, within the College of Education and Human Development at the University of Minnesota.